In a recent paper by Renaud et al. (2016), the authors investigate methods to increase genome editing knock-in efficiency by modifying the chemistry of the donor oligomers to be resistant to nuclease activity. The modifications they tested included locked nucleic acids, where the hydroxyl group on C2 of the ribose is replaced with an ether linkage to C4, and the use of phosphorothioate modified DNA oligomers, where a sulfur atom replaces one of the oxygen atoms in the backbone. 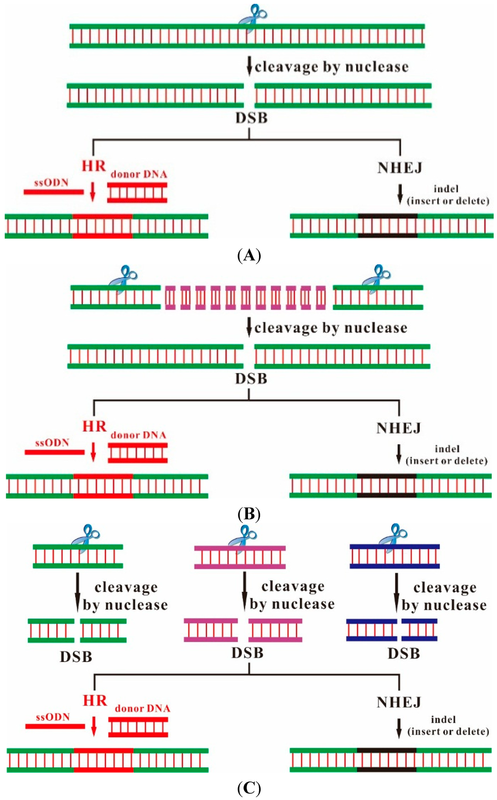 Locked nucleic acids are used to prevent degradation in siRNA experiments, while phosphorothioate modifications aid in the prevention of primer degradation and have increased potential to cross lipid bilayers. The considerations for the use of phosphorothioate oligomers include cost (roughly $5 per modification per ug of oligomer), as well as reported toxicity and the fact that the replacement of oxygen with sulfur generates a chiral center, which may influence DNA-DNA interactions. Because of the multiple effects that the modifications can have on the DNA-DNA interactions, Renaud et al. conducted an extensive study to determine the effect and optimization of the use of modified DNA oligomers for increasing knock-in efficiency in genome editing. In human cell lines, Renaud et al. tested the knock-in rates for small donors possessing microhomology arms (18-27 nt) and a detectable restriction enzyme cleavage site as the “cargo”. This allowed for them to quickly test for knock-in using standard RFLP gel electrophoresis. They found that single stranded donors (ssODN) with phosphorothioate modified bases at the terminal two positions of the 5′ and 3′-ends yielded both the highest frequencies of knock-ins and the greatest precision. With double stranded donors, they could knock in the donor (even without homology arms), however both the frequency and the precision were much lower. Using a high-throughput sequencing approach, they identified that the majority (~90%) of the knock-in events directed by ssODN were precise. In fact, the use of phosphorothioate-modified ssODN donors was found to be so effective and precise, that they were able to knock in a 102 nt cargo at rates similar to (or greater) than the background indel rate at donor concentrations considerably lower than for regular phosphodiester ssODN. The lower concentration requirement alleviates the concerns of phosphorothioate toxicity, and even increased knock-in precision in both mouse and rat (whole animal). Short phosphorothioated oligomers can be a useful tool for the knock-in, or replacement, of small DNA stretches that can include sequences such as recombination sites. Most importantly, however, short phosphorothioated oligomers have a demonstrated greater increase in knock-in precision- ideal for genome editing experiments looking to precisely modify small regions of a genome. Renaud J-P, Boix C, Charpentier M, …, Anegon I, Concordet J-P, Giovannangeli C. 2016. Improved Genome Editing Efficiency and Flexibility Using Modified Oligonucleotides with TALEN and CRISPR-Cas9 Nucleases. Cell Reports 14, 2263–2272.